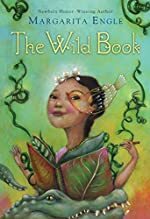 The Wild Book by Margarita Engle. Review: How would you handle the fact that you had Dyslexia, and were being made fun of all the time about it? How would it feel to not be able to fit in like the rest? This is the struggle that Fefa goes through in The Wild Book by Margarita Engle. Fefa lives with her family in a small village in Cuba as she tries to get by with her disease. Engle has done an amazing job with this book of mysterious, joyful, and sorrow poems that all come together to create a magnificent story. In The Wild Book, Fefa finds out that she has a disorder that makes it difficult for her to read or write. How will she ever be able to fit in? She even gets made fun of by her taunting sisters and brothers that tell her she isn't important anymore. Finally, Fefa's mother gives her a huge blank notebook, so that she could write all over it- and it doesn't matter if she messes up. It is her journal to keep; it is her Wild Book. Later on, Fefa and her family find out that there are kidnappers on the loose. They start to receive threat letters, and no one is safe anymore. Fefa's brother gets severely injured, as well, to make matters worse. The family eventually tries to get away from the sorrow by staying at the beach, but when they come home, nothing has changed. Fefa just isn't living life the way she planned. How can she fix it? I found this book to be a great tale about a young girl with hopes and dreams. The Wild Book is appropriate for all ages because it sends out a phenomenal message to always believe in yourself, even if others try to bring you down. This novel was amazingly written; I loved how Engle told the story in a series of poems instead of paragraphs. I think that's a very unique way of writing a book, so this would be a great read for anyone who loves to write or read poetry. I defiantly give The Wild Book a 5 out of 5 review, and I'm sure you would too! We would like to thank Houghton Mifflin Harcourt for providing a copy of The Wild Book for this review. Have you read The Wild Book? How would you rate it?